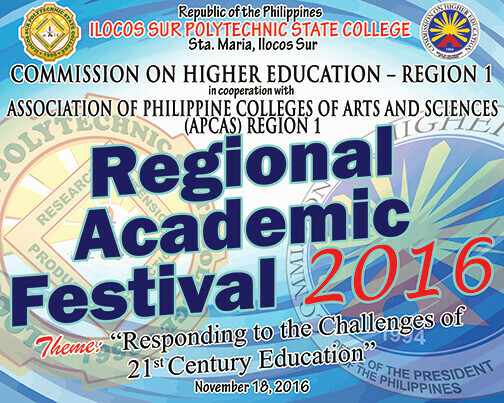 The Association of Philippine Colleges of Arts and Sciences (APCAS) in cooperation with Commission on Higher Education (CHED) conducted the Regional Academic Festival 2016, November 18 at Farmers’ Training Center (FTC). With the theme “Responding to the Challenges of 21st Century Education,” APCAS believe that students must be part of struggles and their job is to prepare them to participate as active citizens in a democracy and train them on how they’d respond as effective agents of 21st century education. CHED and APCAS prepared different activities such as Extemporaneous Speech, Dagliang Talumpati and Quiz Bowl to promote Arts and Sciences. The said event, first time hosted by ISPSC, was participated in by selected students, faculty members and zonal coordinators of the different colleges and institutes in Region I.